Although Bangladesh is a populous and formally democratic country, internet penetration remains low and many politicians and legislators do not use social media or other forms of instant communication, making it difficult for common people to reach out to them. A new platform containing all the information of the members of parliament and different means for communication with them is giving Bangladeshis the option of contacting their local elected representatives, however. Some lawmakers have already begun responding to public queries. A frequently used phrase in Bangladesh these days is ‘Digital Bangladesh’, which is the idea  that IT can be used in administration and governance to ensure transparency, accountability and answerability at all levels of society and state. Although there is visible progress in terms of Bangladesh's digitization in other areas, many elected MPs and government officials are still not using digital means to make themselves accountable to common citizens. According to recent news reports , although many of the MPs have Facebook IDs or pages, they are not official, and are mostly run by fans. Only seven Facebook profiles and two Twitter accounts belonging to MPs are verified. 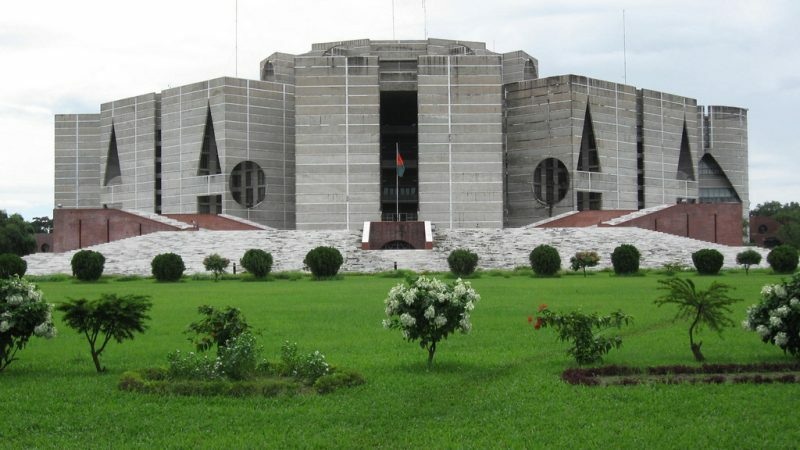 Most MPs therefore are not active on popular social media platforms like Facebook or Twitter while many citizens complain that MPs are not reachable via the official contact phone or email provided on the Bangladesh Parliament website . Some years ago I went to the local MP's house to discuss some issues in our neighborhood. He lives in the capital, nowhere near the electorate. It was already 10 am and I was told that he still was asleep. I waited for some time more but could not meet him. I have to say that many elected members of Parliament of our country think of themselves as kings, rather than representatives. Whereas they should be totally accountable to their electorates. Screenshot of Amar MP website. Amar MP  (My Member of Parliament), is a volunteer-based, non-profit, non-partisan initiative created by a group of Bangladeshi online activists  and spearheaded by expatriate blogger Sushanta Das Gupta. The over-arching mission is to make MPs aware of their responsibilities and try to ensure their accountability to the electorate. 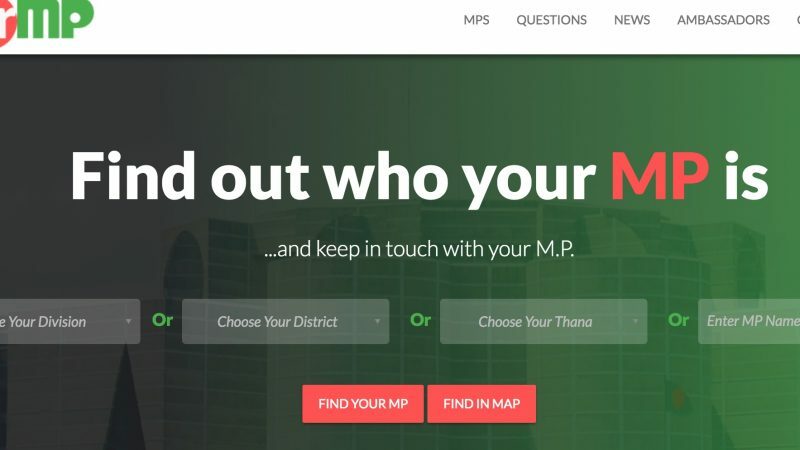 The platform lets users  find out who their representative in their area is and all about the MPs themselves including their publicly filed statement of wealth. They have the option of contacting them via different contact numbers and social media accounts listed on the website. Moreover, if they fail to contact them through these means, they can also pose questions to MPs directly through the platform. Users will have to register to the website (they can also register with their Facebook ID) to be able to contact an MP. This will prevent trolling, and any abuse will be filtered by  the Amar MP website before reaching the MPs. The website has been up for a few months now and has already generated a buzz. People are sending questions  about the cleanliness of towns , making MPs aware of the infrastructure needs  of villages and complaining about local drug problems . Thanks for sending this question. I would like to inform you that a list of the known drug dealers is being prepared by the relevant authorities and steps will be taken against them. I hope that we can eradicate the drug problem in this region within the space of the next year. For the first time an MP in Bangladesh answered questions from a voter through a video message on YouTube. I cannot imagine how the citizens are not being helped by this. Many MPs are becoming aware of the electorate and active on social media, becoming inspired by this website. @amarmpbd  @sajeebwazed  @albd1971  @zapalak  MPs being connected digitally should be the norm, not the exception these days. The website has called for applications  from volunteers to become ambassadors of constituencies who will liaise with the relevant MPs regarding queries submitted through the platform. Many MPs are vetting the ambassadors  designated for their electorates. I think MPs should be trained on how to use Facebook, Twitter or even email. Every MP should do it, so that they become comfortable using these media and become prolific. Following its trial run, the website will be formally launched  in March. Its Facebook page  has more than 36k followers and helps users deal with any problems they encounter using the website.